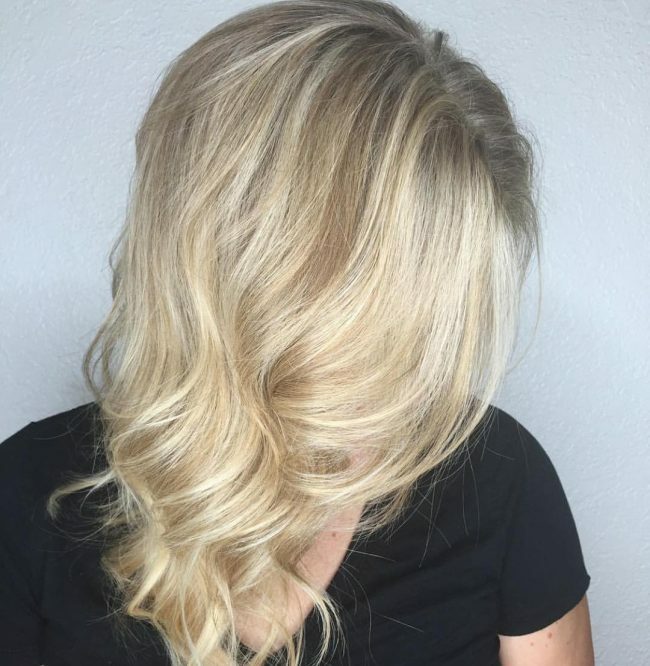 Medium blonde hair is for ladies that not only want to keep up with the times but also want something subtle but will brighten their appearance and not make it obvious that their strands have some artificial coloring. 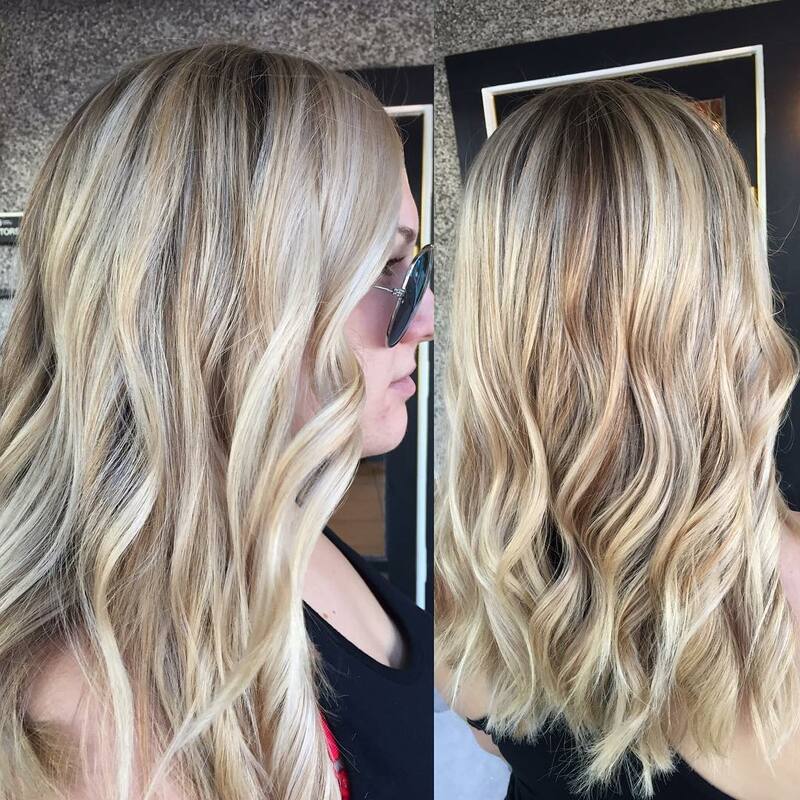 Blonde is a simple and gorgeous shade that looks good on most complexions. It can also work for any length, but it gives medium length hair a unique appeal. 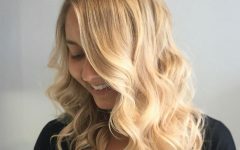 There are many ways and designs of applying blonde hues on your medium hair, and you can either use balayage or the traditional foils. Combining the hue with other shades to create a distinct tone is also an excellent idea. Look through the pictures below for some inspiration on how you can wear this stunning hairdo. 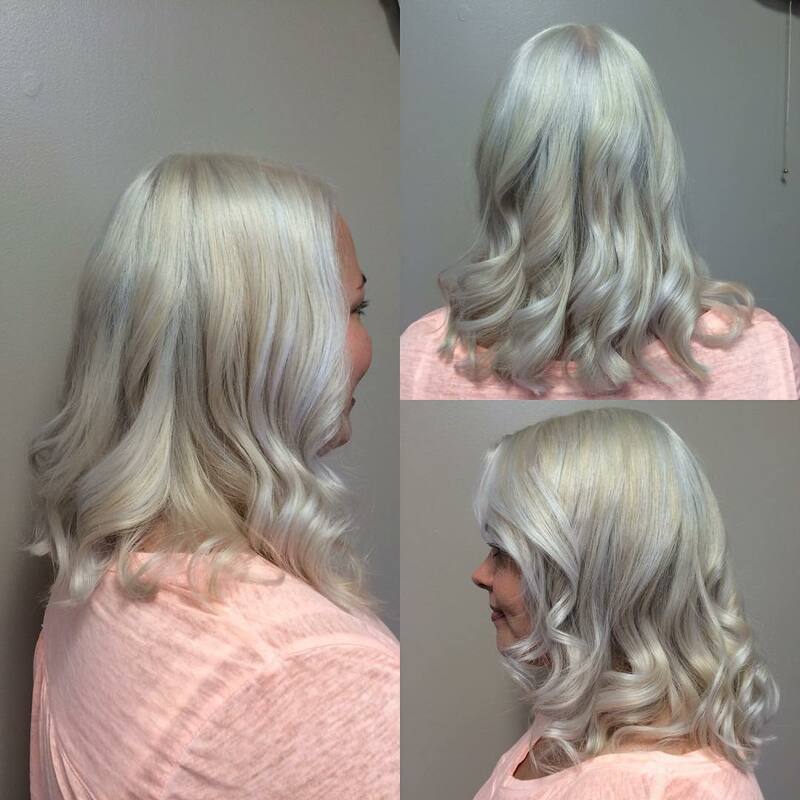 The smooth transition between the silver and white blonde shades in this hairdo is just amazing, and it will make any woman look majestic. This hairdo also has some light brown roots that bring a slight contrast to the design. The cut is also perfect, and it entails chopping the medium length wavy blocks for some texture and styling them with a center part. Balayage will always give you a refined look, and you only need to have the right colors and also know how to use them. In this design, the technique paints some bright blonde streaks on the natural brown hair to create a fantastic shade that makes the shoulder-grazing wavy locks look startling. The styling entails sweeping the hair to the sides and over the forehead and it also adds to the elegance. 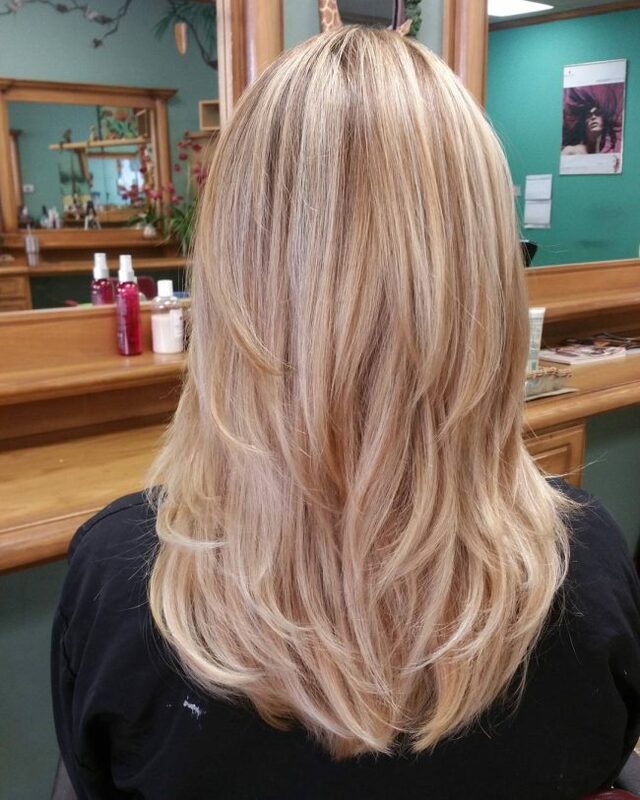 Highlights are very trendy, and they will always add some beauty to any hair. 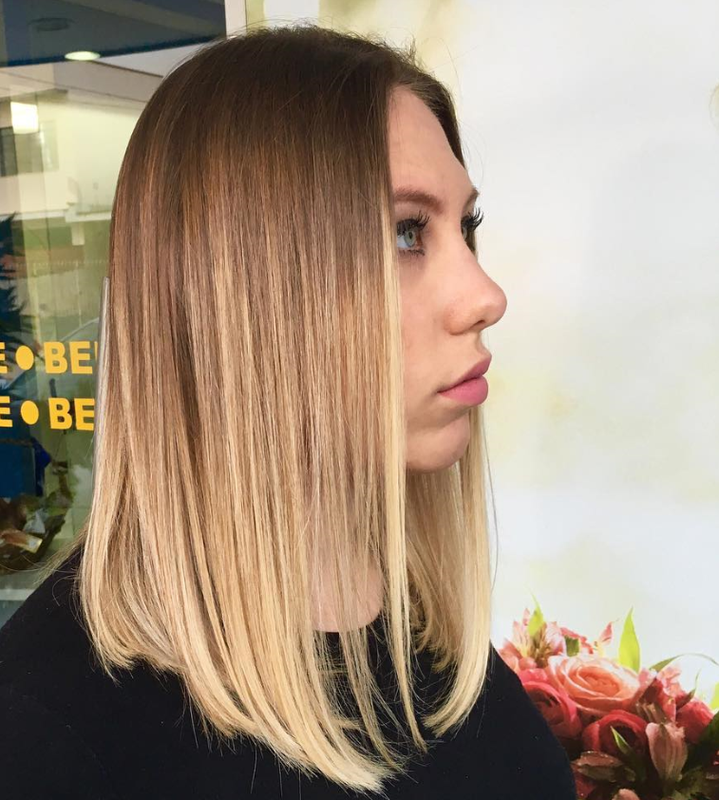 This design entails using balayage to paint some blonde streaks on the honey brown hair to create a modern and stylish color design. The hair also has an excellent texture and a blunt cut, and you only need to sweep it back to style it. This long bob has a fantastic cut, volume, and some beautiful subtle waves. However, the color is still what makes it look magnificent. It is a simple design that entails free hand painting some blonde highlights on an ashy brown base. 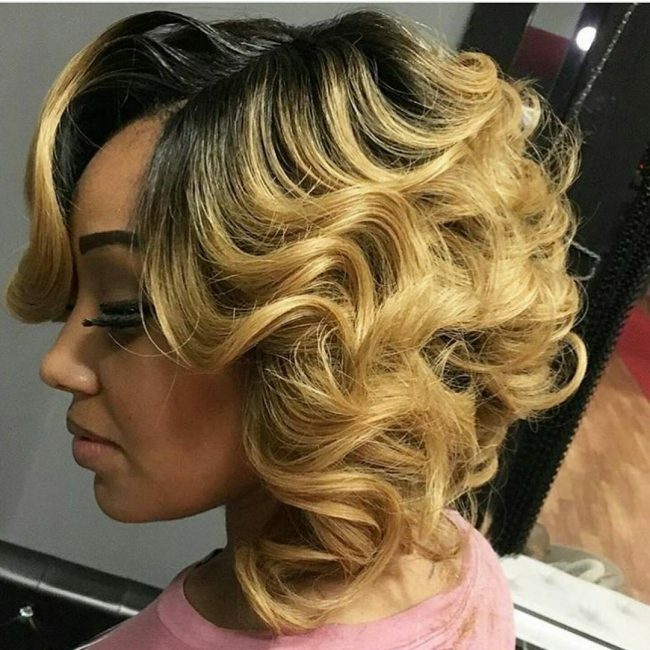 Hair like this one will give a woman all the confidence that she needs, and it is perfect for any occasion. The medium size hair has a decent volume and some soft waves that make it look fabulous, but the blend of the different shades of brown is what makes it look adorable. These strands also have a lovely dazzle that makes them look very healthy. This triple toned balayage hair looks fantastic, and it proves that you can still create a polished appearance by using several shades on your hair. 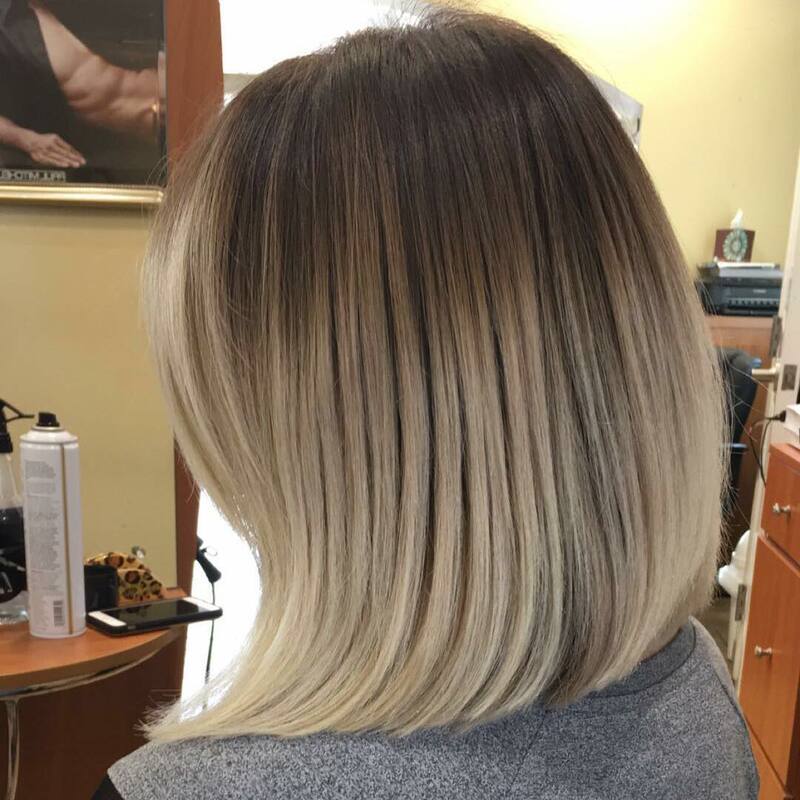 The color design entails transitioning from black roots to a light brown hue and then to a white blonde shade on the ends. These strands also have an excellent blunt cut that you can enhance by sweeping them to the sides from a center part and in layers. 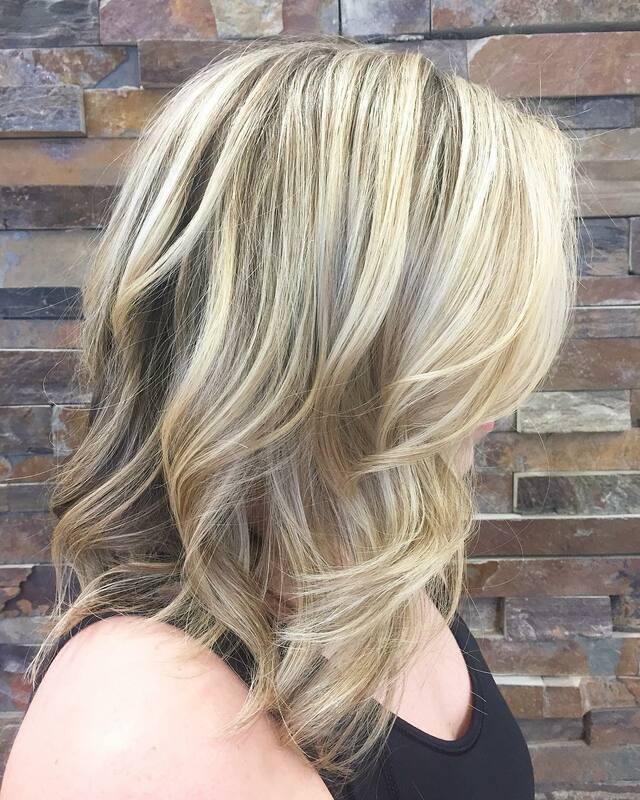 A bright blonde shade is an excellent choice when you want to give your strands a dimensional appearance. In this design, it blends with a brown shade to create an appealing tone, but the dimensional appearance comes from having the bright shades as some partial highlights at the front. Medium blonde hair is as classy as you can ever wish for and this cute hairdo proves this beyond doubt. 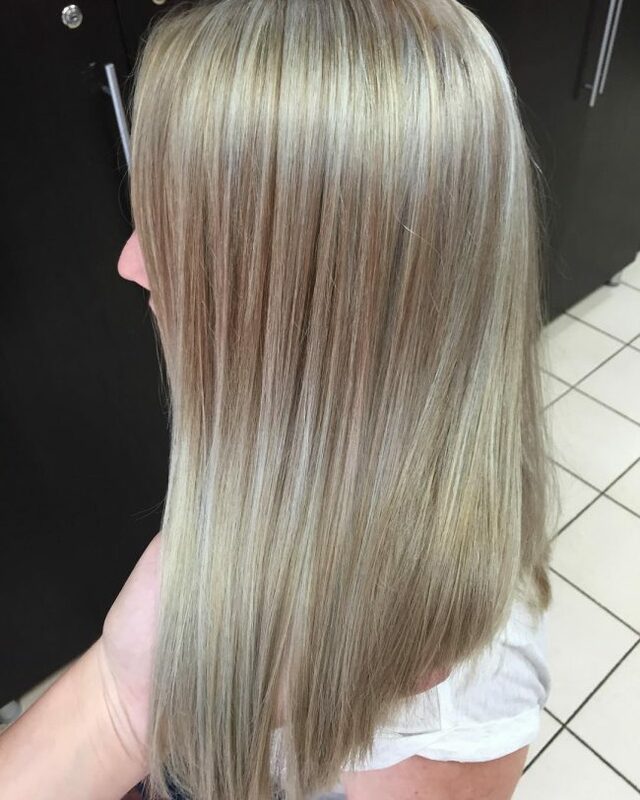 The platinum shade is throughout the head but some sections are brighter than others, and this creates a unique color pattern. Apart from this, the thick mane also has some lovely brushed out curls on the ends that make this a top notch and refined headdress. 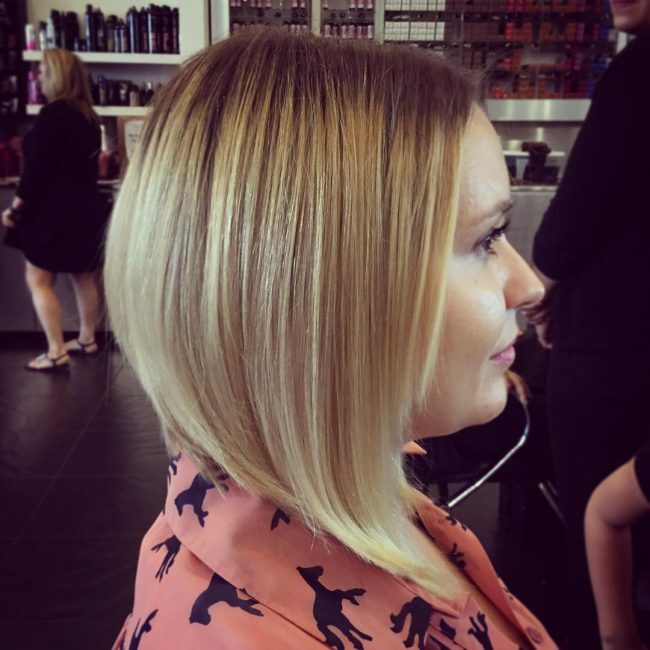 An excellent cut like this one will make any woman look extra-chic and polished. The haircut gives the strands a remarkable uniformity that you can show off by sweeping them back in subtle layers. 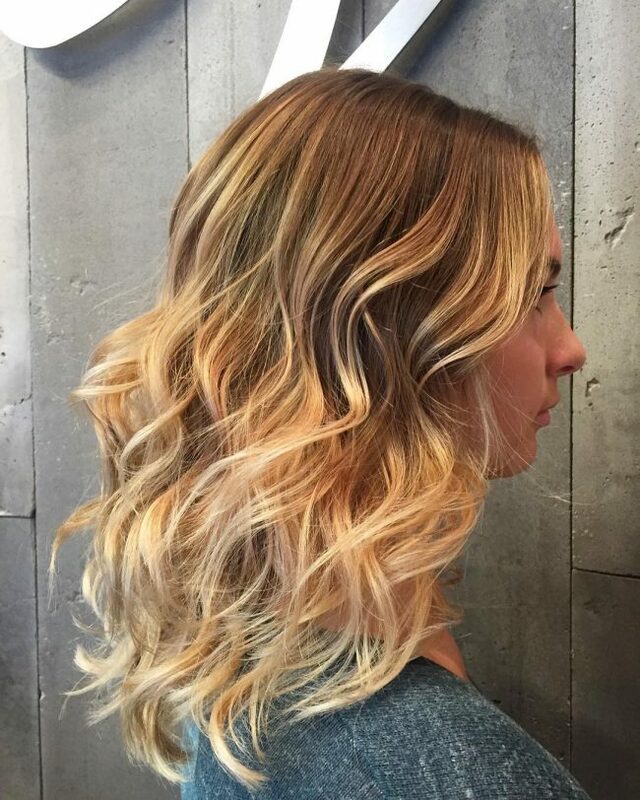 Apart from this, the color blend is also excellent, and you can only achieve it through balayage. These locks might not have a uniform length throughout, but their fancy haircut and curls on the ends are as adorable as you can get. The hair also has a beautiful color that comes from introducing a platinum blonde hue to the natural brunette shade. You should finish the look by sweeping the curly locks to the side and giving them a slight mess. 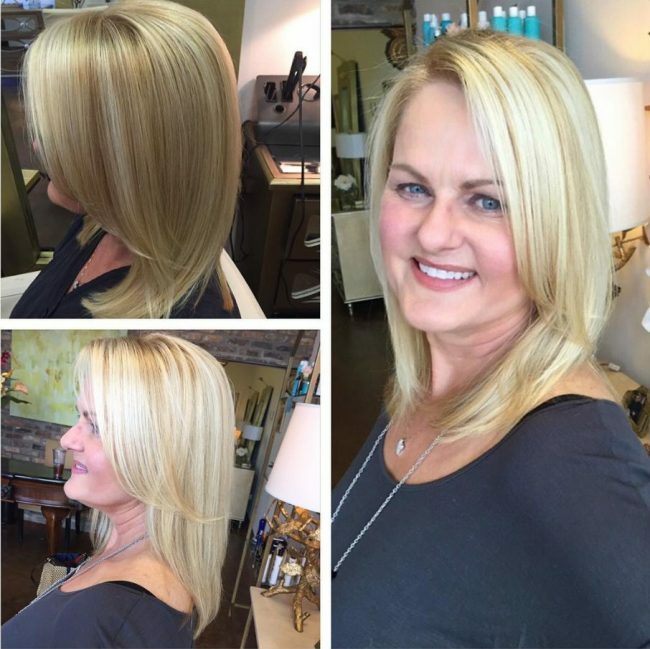 This long bob haircut has some beautiful waves and a side-sweep styling that makes it look glamorous. The color is also breathtaking. 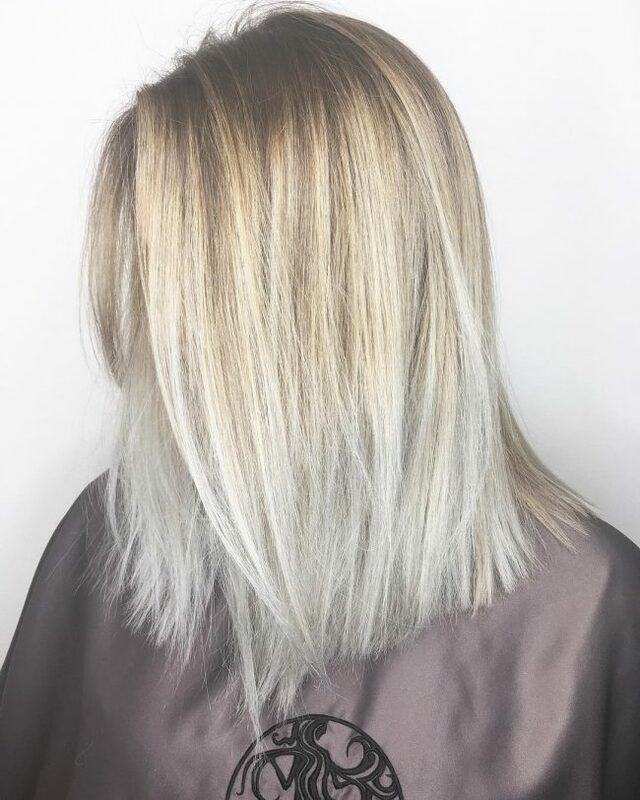 It starts by having a platinum blonde hue throughout the head and giving it a root extension using balayage to create a lovely ombre contrast. 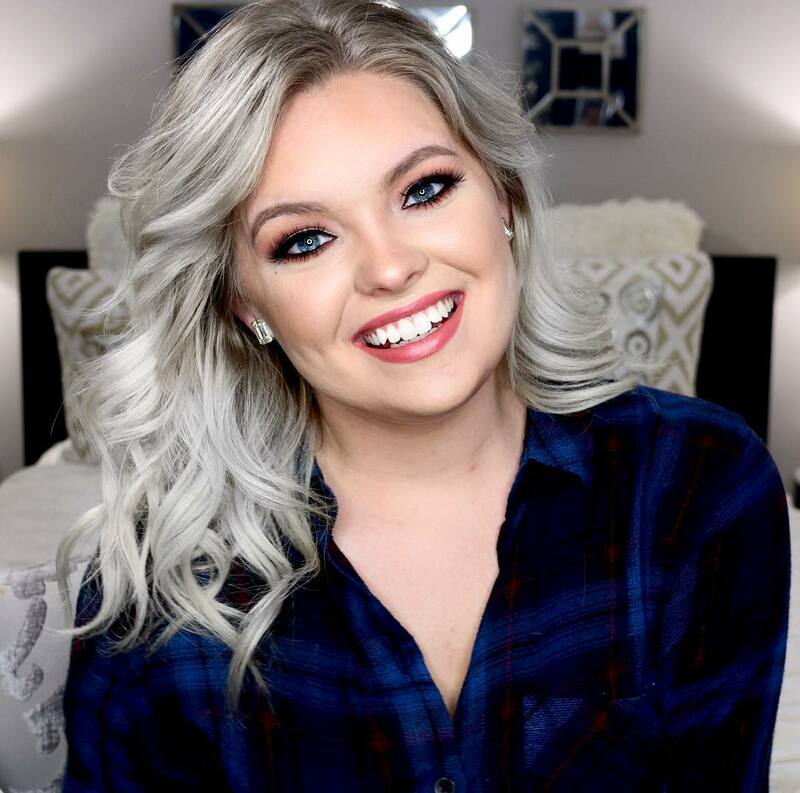 Most ladies prefer to use a blonde hue to highlight their natural color, but if you have it as your base shade, you can give it some nice streaks with a gorgeous brown shade like this one. 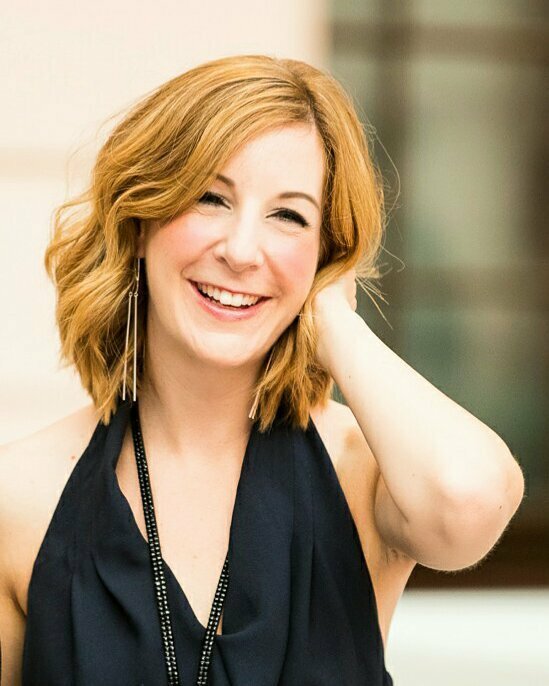 Apart from the highlights, this hair also has a smooth and asymmetrical cut that you can enhance with a side part and sweep. You do not have to do much to improve the appearance of your honey brown hair because introducing a blonde hue on the ends to create an ombre pattern is enough. However, this particular hair also has some lovely curls on the ends that also help to spice up the appearance. The silver blonde and brown color blending on these straight strands is just amazing, and it will make any woman look stunning. These straight locks also have a nice blunt cut and sweeping them back is all the styling that you will need to finish the look. 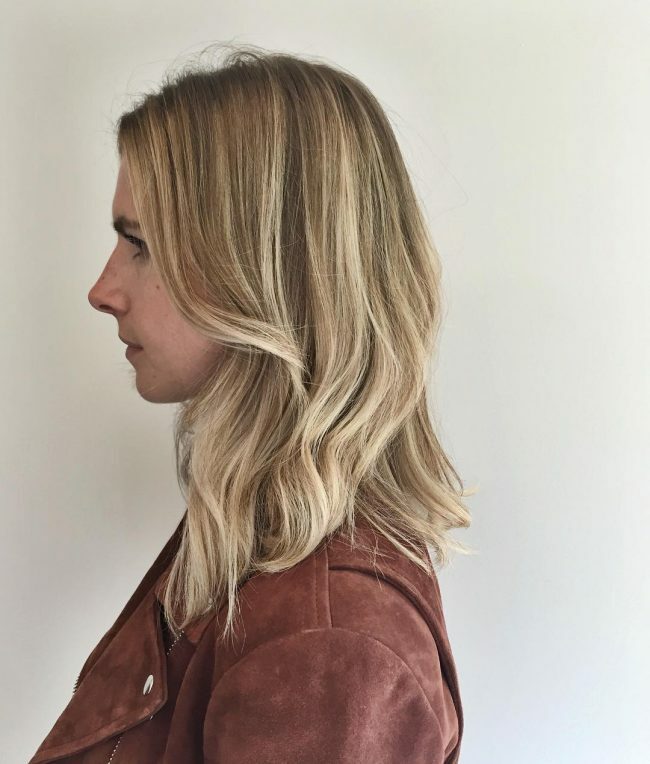 This medium blonde hair is breathtaking, and this is a result of a creative asymmetrical and blunt cut and a neat blowout. Hair color in this design is also splendid. It entails blending dark hue of blonde and brown and shadowing the roots to create a glamorous headdress. These wavy blonde strands look very natural, and it is hard to tell that they have a balayage coloring. The beautiful wavy locks also have a slight hint of light brown that also helps to enhance the natural appearance. However, you cannot achieve this design without the long bob cut and the face framing style. Beach waves make an excellent hairstyle for any season, but these look way much better than others. 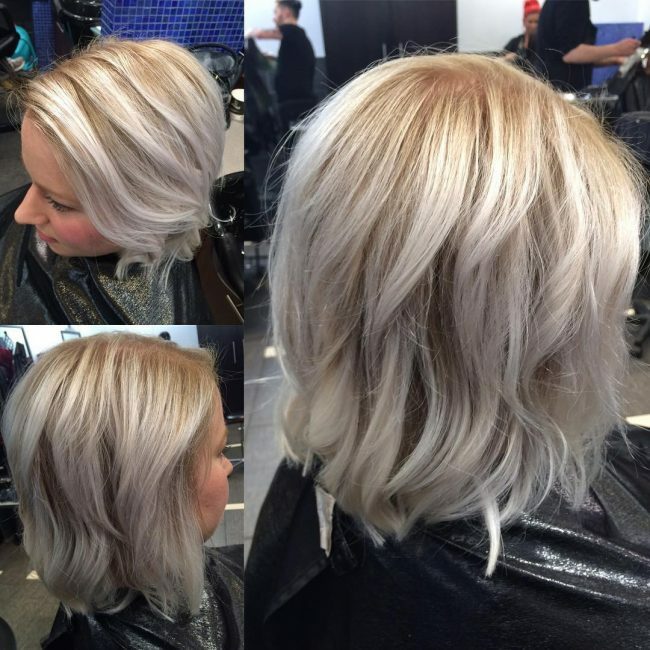 This medium blonde hair has not only a beautiful color but also an adorable styling. The styling involves giving your strands some cute waves and sweeping them back. However, the color design that entails transitioning from dark brown to light blonde is still the highlight of the headdress. Even if you are not sure what to do with your medium long hair, you can always be confident of a top notch appearance if you give it a beautiful color and some thick and sweet curls like these. 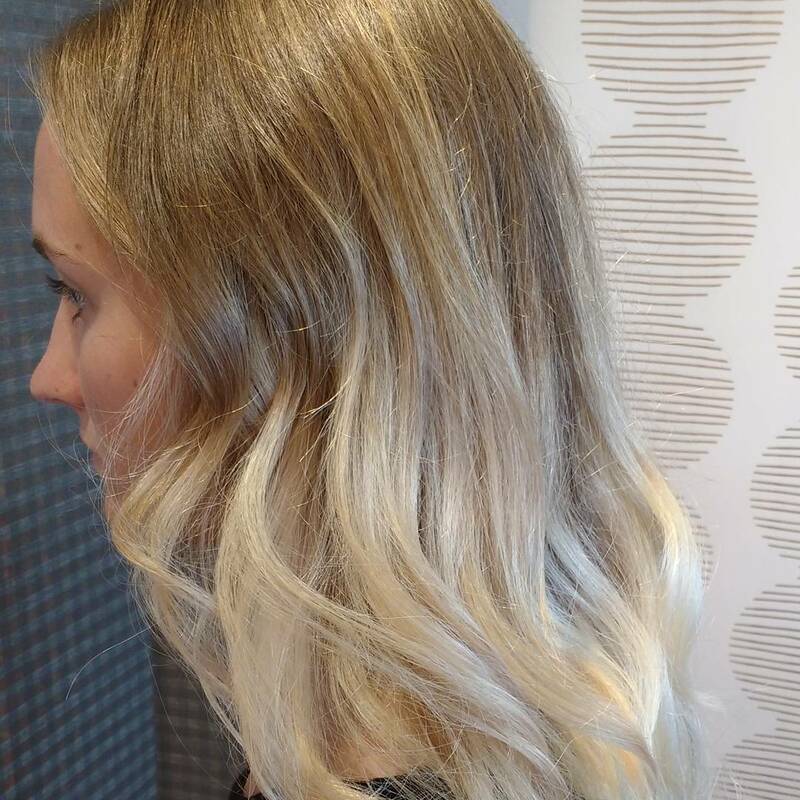 Here the color pattern entails transitioning from the black roots to a golden blonde hue to create a lovely ombre design. 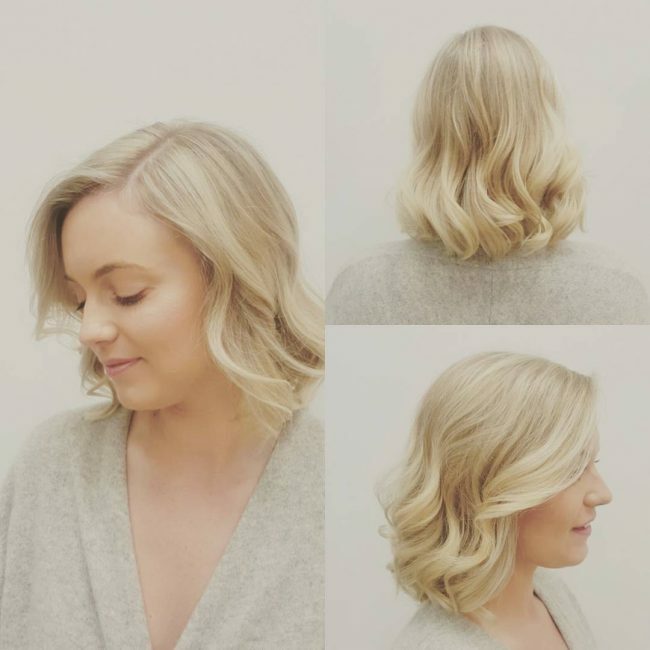 Here is another long bob haircut design that also looks magnificent and it perfect for any lady that prefers to keep her locks medium in length. It entails chopping the hair to give it a nice blunt cut and then dying it with a blend of brown and blonde to create a stunning headdress. If you have a light brown shade or honey brown as your base color, then you do not have to do a lot of work to create a stylish hairdo. 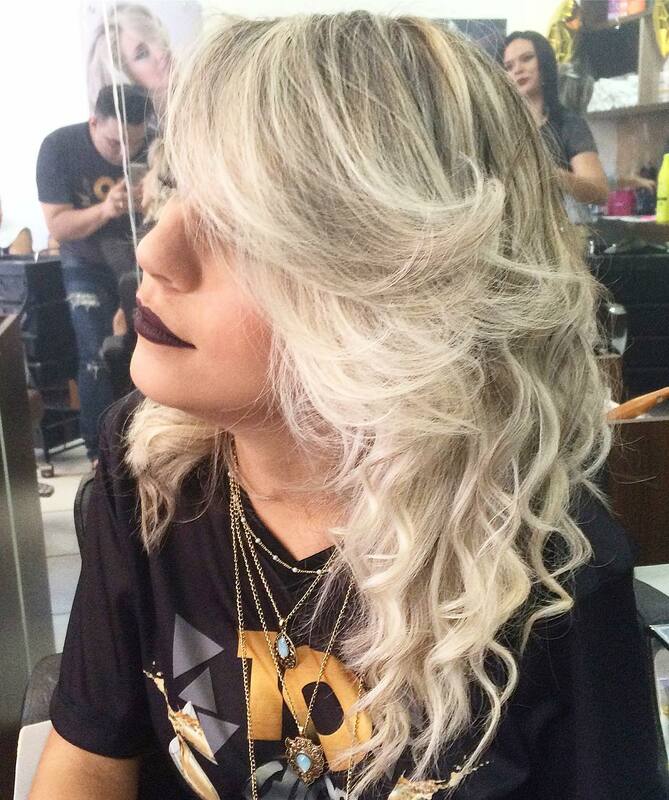 This design only entails hand painting some blonde streaks on the brown locks to create a lovely shade. The strands also have some subtle waves on the lower half, and you should style by center parting them and by sweeping the tresses to the back. 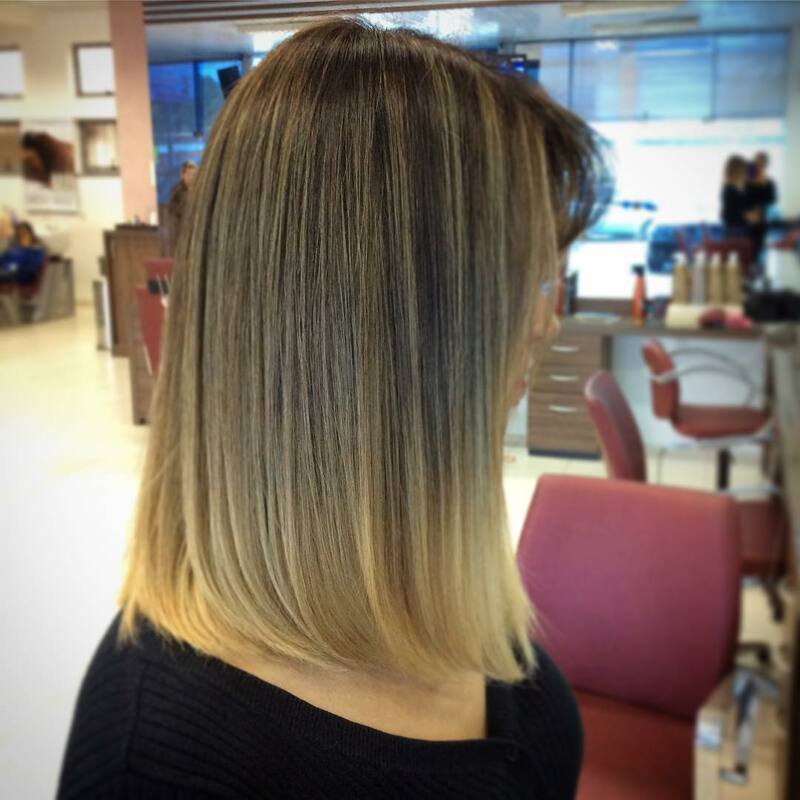 This ombre hairstyle is quite charming, and this is because of the perfect color design and cut. 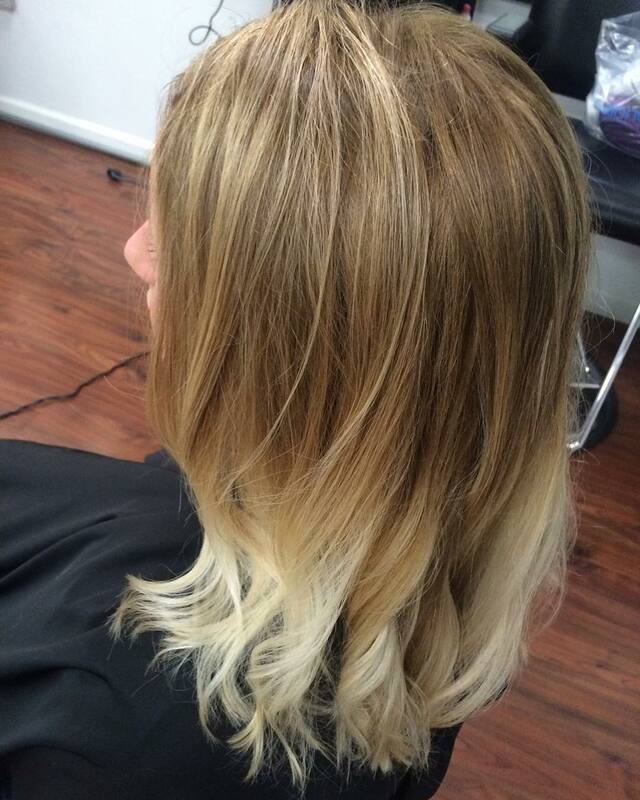 The hair has a light blonde shade throughout, but the roots are shadowed to create a beautiful ombre pattern. 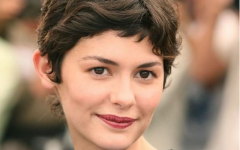 Their simple cut is easy to replicate by chopping the ends to give the strands some texture and then style them into a face frame using a center part. 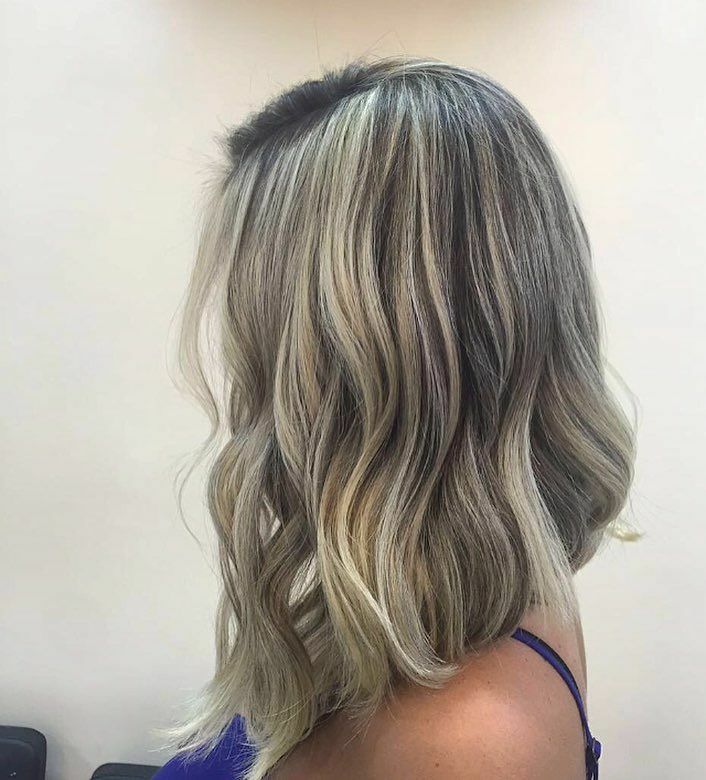 It is not by chance that most ladies prefer to use balayage when coloring their strands because it will always give them a distinct and adorable tone. In this design the technique transitions the long wavy locks from a light brown shade to a bright blonde to create a chic ombre pattern that will turn heads. The softness of babylights is irresistible, and this makes it perfect for your medium blonde hair look. In this design, the strawberry blonde baby lights accentuate the textured locks to create a unique hairstyle that you should finish by sweeping back the tresses in subtle layers. Colors are all about creativity, and so you can achieve a stylish shade with any hue provided you use it inventively. This headdress has a bright and natural looking blonde shade throughout but shadowing the roots is what makes the design look unique. However, the medium strands also have a lovely shoulder-grazing cut and a cute style that entails brushing the hair to the sides in layers. A half-up bun is an elegant and modern hairstyle, but this one is a class above the rest. 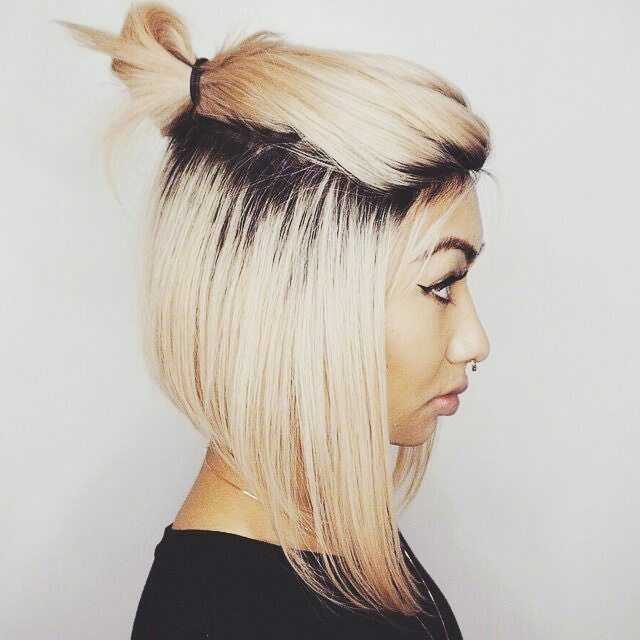 It starts by chopping the strands into an asymmetrical long bob. You should then bleach them into a light blonde shade but leave the roots in their natural black shade. The last step is to pull the strands to the center of the head and tie them with a band. Your straight and smooth strands will only need a beautiful color and innovative styling to create a cute hairstyle. 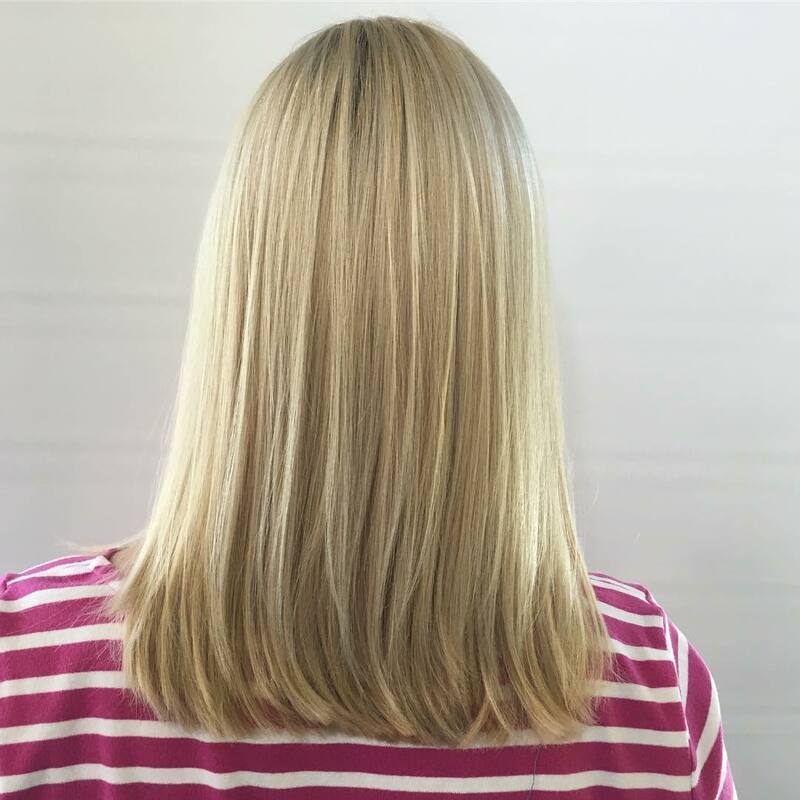 In this particular design, the strands have a simple, blunt cut and a smooth color pattern that comes from transitioning from a chocolate brown base shade to a blend of light brown and blonde in a sombre pattern. Once you have the color, the last step is to form a center part and sweep the hair into a face frame. Using multiple shades on your hair is an excellent idea, and it will not only make it look unique but also give it some class. 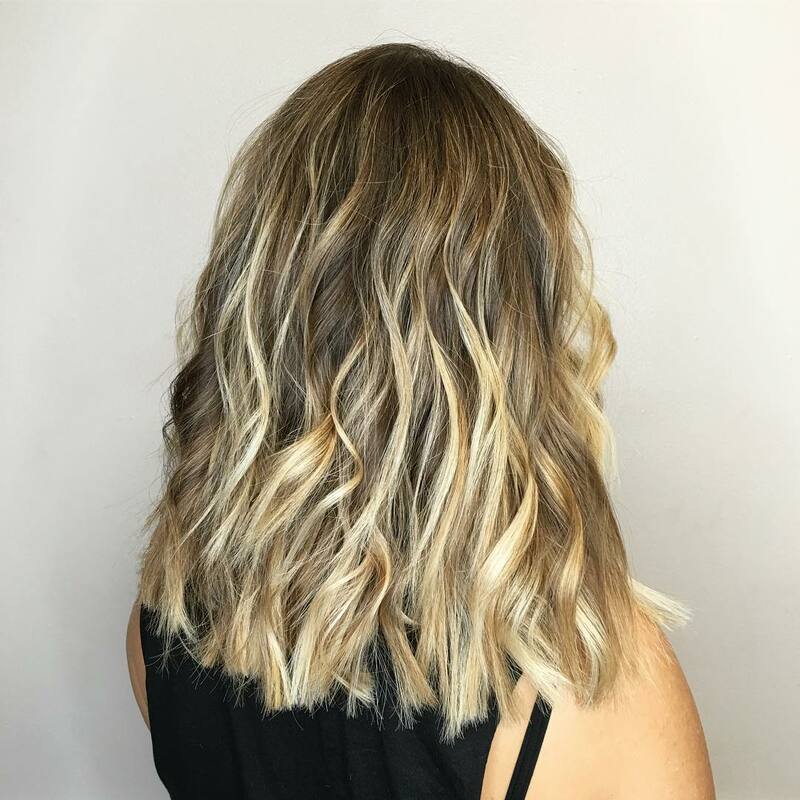 In this design, the wearer uses balayage to paint different shades of brown and blonde on her thick and wavy mane to create a striking color pattern. And the only other thing that she needs is to sweep the strands sideways and back to finish the beautiful headdress. Blowouts may seem ordinary hairstyles, but they will always make you look stylish, and they are also easy to create. 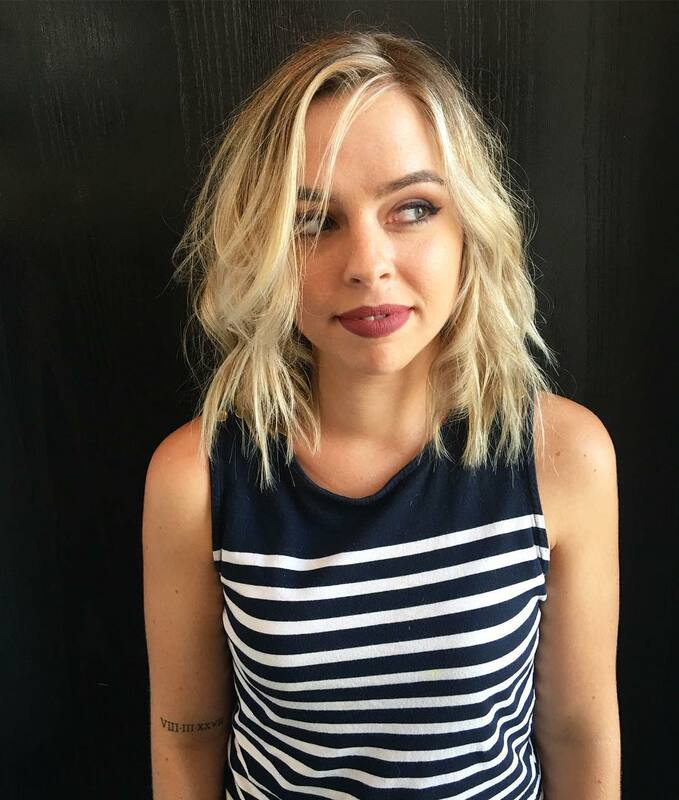 This hairdo is a typical blowout, but it has a lovely cut and styling that create an adorable A-line bob. 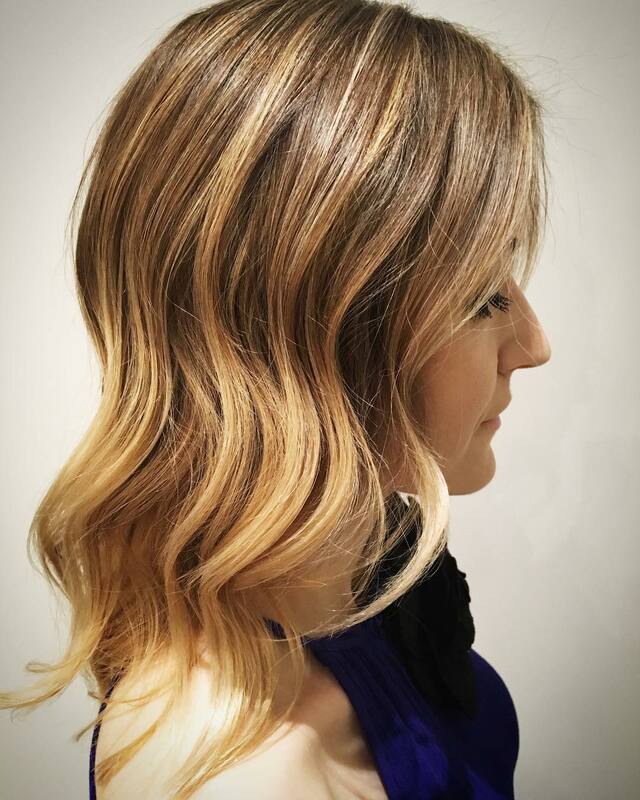 The color is also stunning, and it entails transitioning from a honey brown to a blonde hue in a sombre pattern. 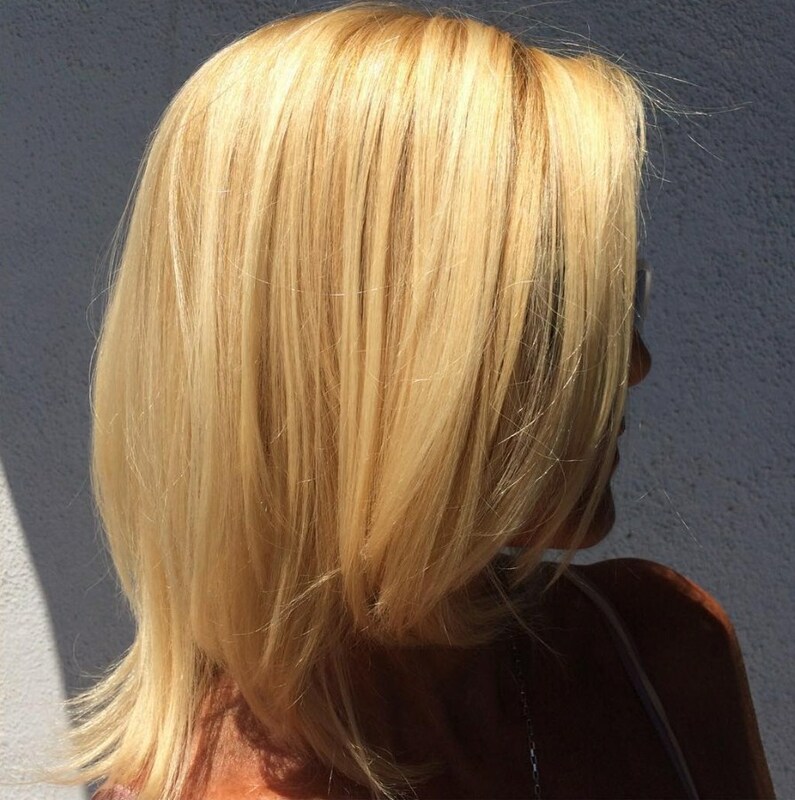 You can never go wrong with a long bob haircut because it will always make your medium size locks look adorable. The long bob cut in this design has a nice cut that entails making the ends blonde, but the brown shade with a hint of blonde is what makes it look fantastic. 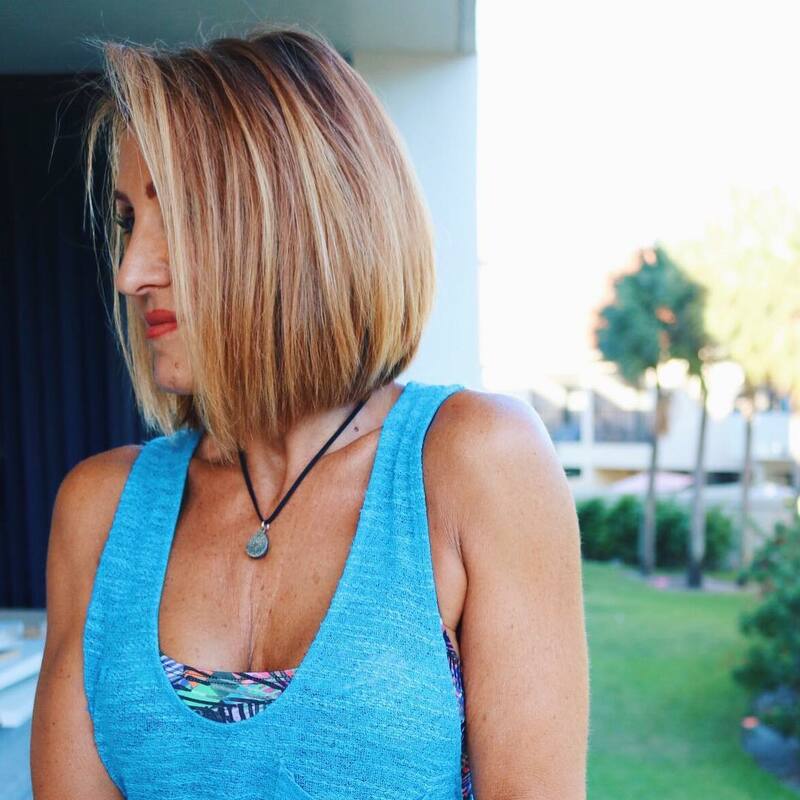 This long bob is the kind of hair that will always put a smile on your face every time you look in the mirror. It is also a very simple design that starts by chopping the mane into a textured and wavy medium length. You should then give it a beautiful brown shade throughout the head with subtle blonde streaks and finish by styling it with a side part. Medium blonde hair is as stunning as you can ever wish for and there are also many styles that you can create with it. You can have anything from thick curls to a smooth and soft straight hair as it all depends on your personal preferences. The 30 glamorous styles above will give you plenty of ideas on how you can create a chic hairdo with a medium length mane.